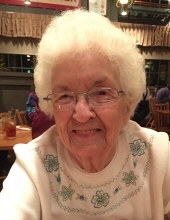 Virginia Martin Cochran, 94, passed away peacefully, Monday, April 8, 2019 at home, under the care of her family. Born July 24, 1924 in Danville, Virginia, she was the daughter of the late Ila and Jessie Martin. She was also predeceased by her husband of 73 years, Frontis E. Cochran and a granddaughter, Jennifer Holliday. Over the years, Virginia worked at various jobs, but was proud to have been a homemaker for most of her life. A talented cook, she loved setting the table and sharing her southern hospitality with anyone who might drop by. Left to cherish her memory are her children, Evans Cochran and wife Karen, Cathy Talley-Banks and husband Bill, Mary Brantley and husband David, Beth Cochran and partner, Bill; six grandchildren, and five great-grandchildren. Virginia Martin Cochran passed away peacefully April 8th, 2019 in the care of her family. Virginia was born in Danville, VA to Ila and Jessie Martin on July 2th, 1924. She was pre-deceased by her husband of 73 years, Frontis E. Cochran, and grand daughter, Jennifer Holliday. Virginia leaves the cherish her memory her children, Evans Cochran and wife Karen, Cathy Talley-Banks and husband Bill, Mary Brantley and husband David, and Beth Cochran and partner Bill; 6 grandchildren and 5 great grandchildren. She had a love for life and enjoyed many things, but her love for her children outshone them all. Her primary job in life was to be a mother and caregiver to her children and anyone that needed advice. She was always available for those that needed to talk about their issues. With four children and one income, often times were tight. Being a determined Martin, she found ways to make ends meet. Early on she kept foster children, and then sold Stanley products, giving in home parties in the evening. She later went to work at PWC Norfolk. After leaving the base, she became a social worker for the City of Chesapeake. Her last paid position was the Sylvania “TV” lady at Chesapeake General Hospital. We focus on “Paid” position as she ALWAYS worked hard whether at home or on the job. She and Frontis kept a garden from which she canned and “put up” fresh vegetables. Snapping beans and shelling peas while sitting on the breezeway was just a way of life. Canning tomatoes, and making pickles was a ritual that occurred annually. Whether it was seeing that the cow was milked before school, or the eggs were rounded up, she was always doing what was necessary to take care of her family. Virginia was the QUEEN of couponing long before it became the thing to do. She was SO THRIFTY with her coupons, she could actually purchase goods and not pay a dime for them. She kept what she called a “Stash” closet. No child or grandchild ever left her house without first visiting the “Stash” closet to see what they might need to take with them. She was the glue that held us all together. It is said that behind every successful man there is a determined woman. She was the optimist that said “we can” when others weren’t sure they could. She was the driving force behind the purchase of the family home, finding a way to send the children to camp, getting them piano lessons and the building and furnishing of the family cottage in Nags Head. She loved to sing, especially hymns. It was such a pleasure for her to have someone spend time with her, singing along with her. Her wonderful caregivers would often sing with her helping make her day a little bit brighter. We would like to thank each of them as they were very dear to her. Kim, Cheryl, Nicole, Fran and Cookie were like daughters to her and made her feel very special and loved. For that we thank you. Virginia was a long time member of Centerville Baptist Church and made certain her children went regularly. She passed on her love of the Lord to her children and all that knew her as she lived what she believed. She was the last remaining sibling of the Martin Clan, the Matriarch, and as such was an inspiration to us all. The funeral service will be conducted at 11:00 a.m., Friday, April 12, 2019 at Oman Funeral Home & Crematory, Chesapeake. Rev. Thomas L. Mercer, Sr. will officiate. The interment will follow in Chesapeake Memorial Garden. The family will receive friends from 6:00 to 8:00 p.m., Thursday at the funeral home. In lieu of flowers memorial contributions may be made in Virginia’s name to The Alzheimer’s Association. To send flowers or a remembrance gift to the family of Virginia Martin Cochran, please visit our Tribute Store. "Email Address" would like to share the life celebration of Virginia Martin Cochran. Click on the "link" to go to share a favorite memory or leave a condolence message for the family.